Welcome to Issue #51 of the Bootleggers Buzz! Pff, what a boring week! We at the Buzz had totally no news to write about this week. No fancy updates, no spectacular shootings, no new staff members, just completely nothing! Fortunately we were able to write several columns and an extremely hard riddle for you. 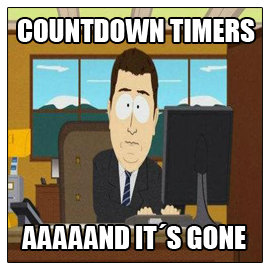 This week we have a column about the fancy countdown timers and about busting. We believe busting is a very important matter in this round and therefore we decided to write a fancy column about it. We also have an article about round 7. The current round is nearly one year old, so it’s time to take a look at the last year and share some highlights. This week we created a topic in the Game Forum about this matter, because we wanted to hear your best moment of this round. We received a nice amount of reactions, thank you very much for that! This week we also had a talk with a new crew; Omega Soldiers. The crew bosses of this crew are Yazoo and Coastie, two well-known players on Bootleggers. This week they decided to claim a bullet factory. Are they going to be targeted now? The Buzz had an interesting interview with them. Last but not least we are giving away 1,000 points, all donated by Poison (the previous Buzz Editor). It’s an extremely hard riddle, so we wish you all the best of luck on this one. Unfortunately a lot of our writers have real life issues, which means we don’t have a lot articles for you. My apologies for that. A short read this week, but it’s your job to show some action! Enjoy the read and have a good Sunday! Last Friday we all logged in to find a brand new multicoloured bar adorning our normal Bootleggers page accompanied by the tantalising yellow glowing update button. Sodium writes about his critical look at the busting system. Sodium has a look at round 7 so far. Round 7 is nearly one year old! Four pictures and one prize! Solve the riddle and win 1,000 points! Yet another crew to arise by the partnership of both Coastie and Yazoo, and it seems they have found themselves some trouble all too soon after their short arrival! A list of all the killed accounts in this week! The crew Axteze officially dropped this week. Two weeks they got shot, but they survived. Unfortunately they weren't able to save the crew spot this week! It was gone for a while but The Sacred Empire is back on the statistics! We at the Buzz wish Vibie and AbuRagheb the best of luck with their crew! Will the comics ever stop? No, they won't.